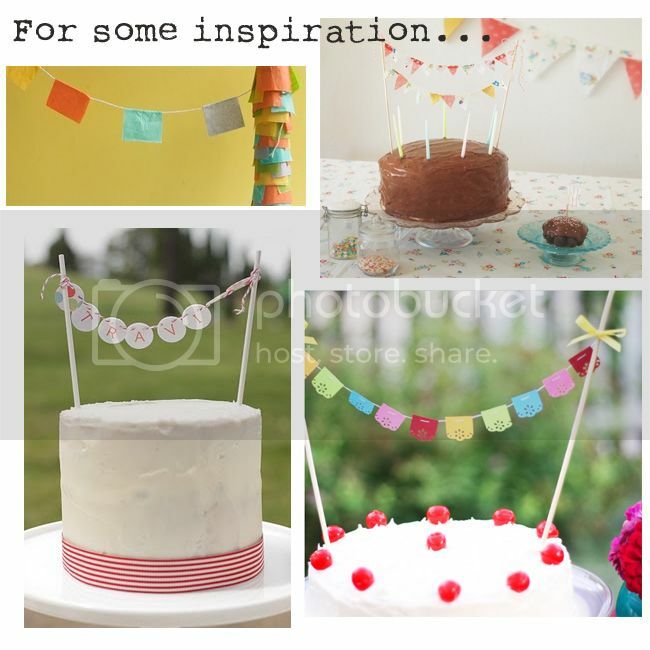 The Wellness Project: DIY: Cake Bunting! This is one of the best DIYs I've learnt. :) Really easy and it makes for some great appreciative laughs and comments at any gathering. 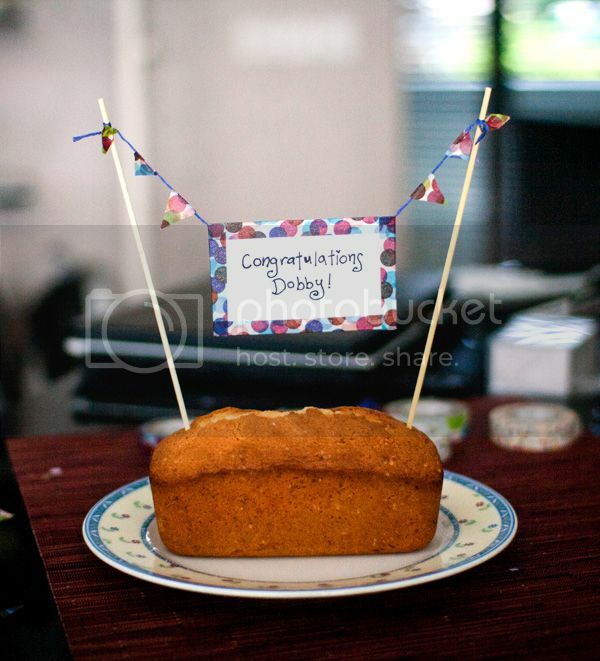 Presenting, a simple DIY for Cake Bunting! Before any DIY, it's always good to get a little inspiration. The possibilities are endless!! You can make your little flags in whatever shape you want - the usual inverted triangle, or even circles/squares/hearts/with alphabets on them...whatever. And you can do one layer or two layers... all up yo you. So, WASHI TAPE is another recent discovery of mine and BOY is it AMAZING. It makes cake-bunting SO EASY and there are a ton of other crafts that you can do making use of this Japanese decorated masking tape. I tried searching online for places that sell them in Singapore but it's not really clear online but I did manage to ask Sarah from Sarah's Loft, who very generously shared with me where she managed to get hers last time. :D Thanks, Sarah! This has the widest selection of washi tape I've seen so far! :D Pretty awesome selection and they sell individual ones or bundles of two. This store is actually a few doors down from ArtFriend but for some reason all the listings online that I've checked label it as being in the basement. Better to just head down to Ngee Ann City and check it out for yourself on Level 4. This has a pretty good selection too and I ended up getting mine from here. Only thing is that they only sell them in bundles of two but at least the paired designs are really nice. Sadly, this one had the most limited selection of washi tapes! I was rather disappointed because they were all at the little discounted bin and the designs were really basic/nothing very colorful or cute at all. But that could be because I went when they were clearing stock or something. It's a great store for tons of other scrapbooking products though! 1. Cut out your string/twine according to how much you estimate you might need based on your cake's diameter. If you cut it 2 - 3 inches longer than the diameter it should be safe. 2. Prepare your paper/name cards - adorn it with whatever words you'd like to write/draw on the blank area. 3. 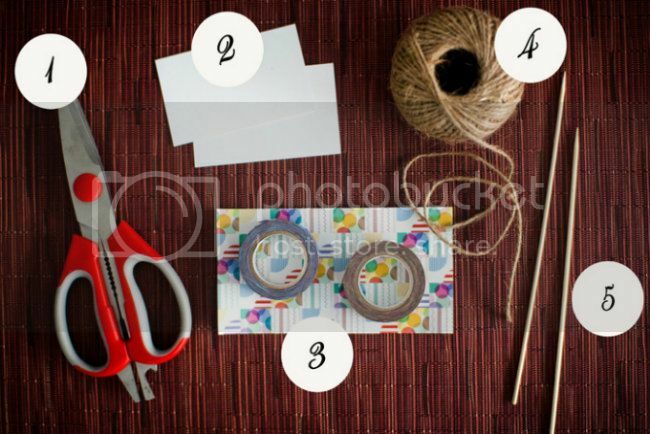 Cut out your washi tape and create a border around the edges of the name cards. (In this case, I wanted to write two separate messages so I made use of two name cards.) Use half the width of the tape on each border of the name card. 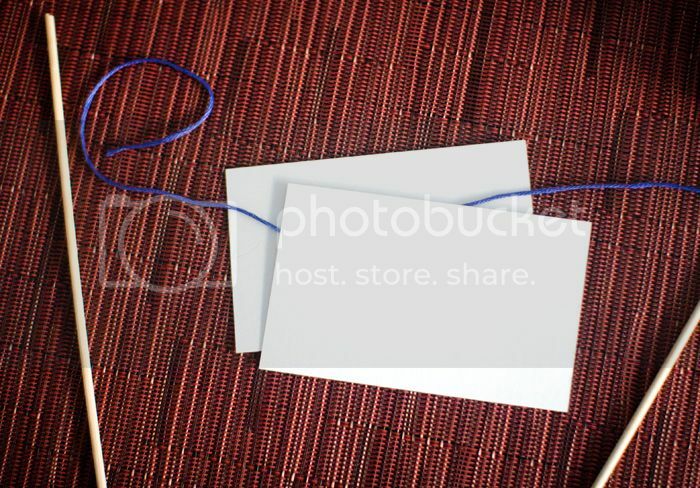 For the top border, make sure the string is hidden in between the name cards when you paste the tape down. Or if you're using a single piece, make sure your tape covers the string. 4. 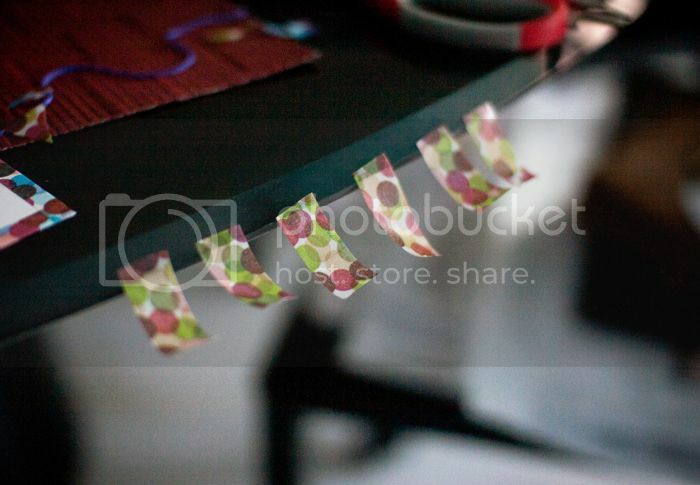 Create your little hanging 'flags' by cutting your washi tape into lengths of about 5cm. (Really depends on what pattern you want.) It's easiest to work from the inside out, starting on either sides of your name card. 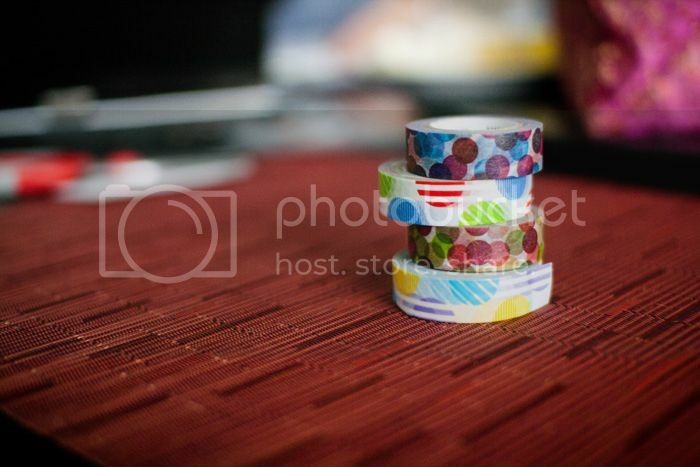 Paste the washi tape strips on the string and fold in half neatly. Cut the hanging strips into triangles. Note: When you are pasting your strips of tape on the string, try your best to not wind the string in any direction if possible! I ended up accidentally twisting/winding the string a little when pasting the tape on it and some of my triangles ended up facing upwards, rather than the intended inverted shape. 5. Tie the ends of the string to the blunt end of your bamboo skewers/Satay sticks. I just tied a dead knot for mine and trimmed off the excess string. You can also paste it on with more washi tape or tie a separate bow onto the two bamboo skewers. 6. 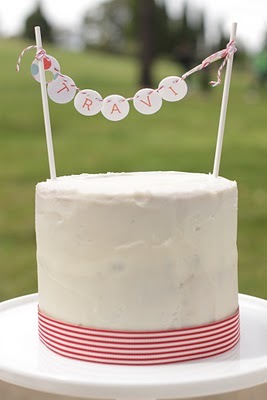 Stick the two bamboo skewers with your bunting in place on either ends of the cake and voila! :) Adjust the height of the sign accordingly. This was my first attempt at cake bunting and I used it on the Citrus cake that I'd made for my sister with this recipe. ;p Am pretty sure with subsequent attempts it'll look a lot more slick but I'm pretty happy with the way it turned out. I'm just happy because it's so much easier than attempting some form of fancy frosting to decorate the top of a cake. But I hope to learn how to do that too...in due time. AWESOME! :DDD Thanks so much!! I'll add this to the post!